Nightingales are a British punk/alternative rock band formed in 1979 in Birmingham, England. The original members were Robert Lloyd on vocals, Joe Crow on guitar, Eamonn Duffy on bass and Paul Apperley on drums, all formerly of The Prefects. The band, before splitting up, played more sessions on John Peel’s BBC Radio 1 show than any other band excluding The Fall and Half Man Half Biscuit. The debut single, “Idiot Strength” was released in 1981 on Rough Trade Records, following which Crow and Duffy were replaced by Andy Lloyd and Nick Beales on guitars and Steve Hawkins on bass. The band signed to Cherry Red Records and released three more singles before debut album “Pigs On Purpose” (Produced by Richard Strange) was issued in late 1982. John Nester replaced Hawkins on bass before next release, the “Urban Ospreys” single. Pete Byrchmore replaced Beales (who went on to form Pig Bros) in time for second album, “Hysterics” (1983), Nester then departed to be replaced by Howard Jenner. The new line-up issued two singles in 1985. Further changes then ensued with Andy Lloyd and Paul Apperley leaving, to be replaced by Maria Smith and Ron Collins. The group continued to release singles, record Peel sessions and tour northern Europe but after the third album, “In The Good Old Country Way”, the band split. After the split, Maria and Pete formed The Capitols, later known as The Rotten Swines (Maria was also a member of Rumblefish), Ron Collins joined The Noseflutes, while Robert Lloyd formed a new band, Robert Lloyd & The New Four Seasons, who after a few releases on In Tape were signed by Virgin Records. Lloyd recorded one solo album for Virgin, “Me And My Mouth”. 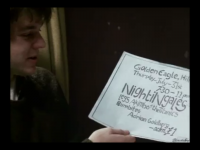 Lloyd is currently active in the reformed Nightingales. Pete Byrchmore plays guitar for Goldblade, Gorgeous and the UK Subs. Eamonn Duffy plays bass for Dave Kusworth and Gorgeous. Joe Crow is currently performing solo, but in the process of getting a band together. Nick Beales is in Church Of Elvis, and Andy Lloyd is in Little Red Schoolhouse. Ron Collins is still making music in and around Birmingham. Paul Apperley is now a firefighter. John Nester runs a successful fruit and veg business. Howard Jenner was last heard of working for Help The Aged. Maria Harvey (formerly Smith) still lives and works in Birmingham. Steve Hawkins whereabouts are unknown. The band reunited in 2004 featuring mainstay/band leader Lloyd, original Prefects guitarist Alan Apperley, ex-Nightingales Byrchmore and Duffy, plus former PWEI drummer Robert “Fuzz” Townshend. This line-up released four 7-inch singles in 2004/5 before Townshend was replaced by Aaron Moore of Volcano The Bear. Their first three albums were reissued in 2005. Live appearances include radio sessions for Marc Riley’s Rocket Science on BBC 6 Music, John Kennedy’s XFM show, Terre T’s Cherry Blossom Clinic on WFMU (USA) and Another Nice Mess (NL) in addition to gigs around England. The band also played American music festival South By Southwest in March 2005, alongside dates in Chicago and New York City. The band’s first American dates ever. Since then they have also played at the Klangbad festival in Germany, organised by Jochen Irmler of Faust, and undertaken a second US tour in March 2007. After several line up changes since reforming, the group line-up settled as Robert Lloyd (vocals), Alan Apperley (guitar), ex-Pram drummer Daren Garratt, “teenage guitar sensation” Matt Wood, and Stephen ‘The Night’ Lowe (bass). For a brief July–August 2007 UK and European tour (including a return to the Klangbad Festival on August 4), Nick Blakey of the Boston, Massachusetts band The In Out substituted for Lowe on bass. The Nightingales released their first studio album for 20 years in early October 2006; Out of True on Birmingham independent record label Iron Man Records. A new mini album, “What’s Not To Love?” was released by Caroline True Records on 30 April 2007. In late 2007 Lowe left the band and was replaced by John Roberts. After dates in New York and Boston in March 2008, the group traveled to Faust Studio, Scheer, Germany to record a new album for Jochen Irmler’s Klangbad label. During recording bassist John Roberts left the group. The band played dates in Germany, Switzerland and in Amsterdam, with Christy Edwards of Christy and Emily on bass. Teen Guitar Sensation Matt Wood left following these dates. As a parting gesture he created a life size chocolate replica of Robert Lloyd. In June 2009, the Nightingales played a prestigious slot on the John Peel Stage at the Glastonbury Festival in the UK. The group is currently composed of Fliss Kitson on drums, Wood and Apperley on guitars, Andreas Schmid on bass and Lloyd on vocals. Kitson’s Godfather is ‘Suggs’ of ‘Madness’ fame. Picture is a still from the BBC Arena programme featuring The Nightingales shot at the legendary Star Club, above the Communist Party bookshop in Essex St and features the equally legendary John Peel. 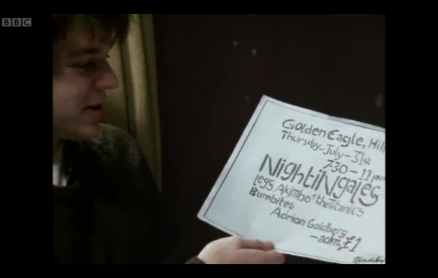 The poster in question is for a gig at the Golden Eagle on Hill St with Legs Akimbo and Adrian Goldberg!